I have been asked whether it would be possible to make mines safer from methane explosions than they currently are. Firstly it has to be recognized that methane is generated with the coal as it turns from the original vegetation into the different varieties of coal, but it depends on how well the coal was sealed into the surrounding rock as to whether that methane is still there. If the overlying rock did not provide a seal, then the gas may have migrated to the surface over the millennia that it took the coal to form. Some of the topic was covered in the article by Tom Maugh discussing methane generation, but I thought it would also help to discuss two different aspects of the story. How a gas explosion could be so devastating, and how one might get the methane out, if possible before mining. If not then how to extract it from the coal before the machines get there. Because methane is often present in coal mines, miners learned early in their career how to check and see whether there was any around. They usually did this by looking at the flame of the candle or other light they were using to work by. 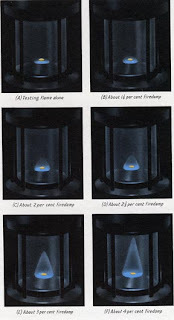 When there was gas present, then the yellow normal flame would be surrounded by a blue cone, the size of which depended on the gas amount present. When the miner saw the flame cone, he would first wave a shirt or towel to stir the methane into the air, hoping that the concentration would fall below 1%, but if the level built up, he might have to leave, or call for more drastic measures to get rid of it. 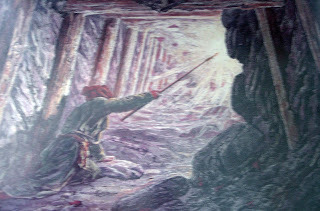 Back in Medieval times there was an individual called The Penitent, who would wrap himself in wet rags and crawl into the mine with a candle on a long stick. Raising the candle to the roof, he would ignite the layers of methane that would gather there, before the rest of the miners came back into the working. Methane, being lighter than air would gather in the roof, when the air currents were not strong enough to mix it into the air and remove it. Obviously with the gas diluted and layered it would burn, but not explode –what makes the difference? Firstly it is concentration, when the concentration gets above 5% (but below about 15% since above that there is not enough oxygen in the mix) the gas will explode. And so if the gas is desorbing from the coal, or has previously desorbed into cracks in the coal structure, which are suddenly exposed by the mining process, then the gas can come out in an explosive mix with the air. Because the air currents along the face are high, that concentration is not held for long, but it is one of the two necessary conditions. The second is that a flame source is also needed, and this would most likely be created by the action of the picks on the mining machine as they rotate through the coal, grinding it from the surface. Picks backed away from the face so that the full pattern can be seen(ACS). When the shearer is moving down the face that full set of picks will be set into the coal. 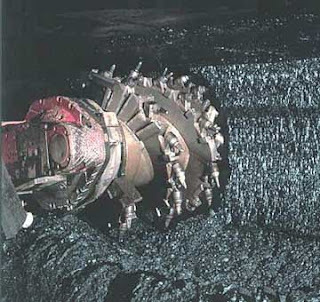 The coal is broken free by the picks and moved over to the conveyor by the shape of the scroll that is carrying the picks that you see in the picture above. But because of the shape of the picks, as they cut into and break out the coal, they will also crush some of it to a fine powder. Some of this is fine enough (between 2 and 10 microns that it can be breathed in by the miners, and to prevent this the cutting head is surrounded by spraying jets of water that are located and operated to capture and knock down the dust onto the floor of the mine. Thus by both wetting the coal and by ventilation with a lot of air, the mines develop plans to make the area safe. The problem however is that within the immediate area after the machine has mined the coal, and while the large coal has been carried away by the adjacent conveyor belt, the fine coal is left on the floor. 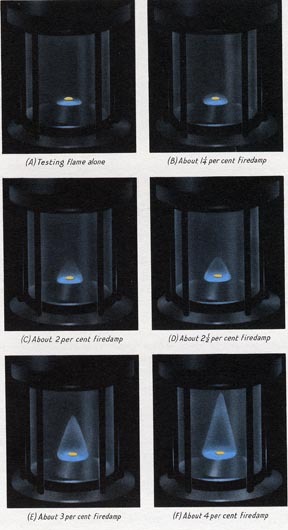 Now when there is an explosion, there is a blast wave that moves down the tunnel faster than the flame front itself. This blast wave can lift up the dust that is lying on the floor and scatter it across the path of the flame front before it gets to that point. Thus a small pocket of methane exploding can generate a cloud of coal dust ahead of itself, which then ignites with a much more powerful explosion, that is self-sustaining as it keeps lifting the coal dust ahead of the blast to continue fueling the propagating flame front. In order to stop the blast there are two precautions that mines take. The first is to cover the walls and floor with stone dust. This is usually a limestone, and so when you go down a mine you will find that instead of the surfaces being black they are white. Now if the blast lifts the dust, it also lifts the stone dust into the passage, and this stone dust quenches the flame front when it arrives. Near the face they can also place stone dust piles on planks that are set in the upper part of the passage way. This dust has to be fine enough to pass through a 240 mesh sieve. When the blast wave hits the barrier it knocks it over spilling the dust into the air, and again quenching the following flame front. In some mines the dust barrier has been replaced with water troughs that serve the same function. The barriers are placed in the tunnels close to the face, since this is the area where stone dust can’t be laid onto the floor and walls, since the mining operation prevents it. While there are a couple of ways of getting rid of the risk (I mentioned last time that using high pressure waterjets to cut the coal instead of picks obviates the heat source required to initiate the explosion) the process that is being increasingly used is to drain the methane from the coal before the mining process begins. Par of the historic problem with introducing this methane drainage is that it is a different fuel resource than the coal is, and thus the mineral rights to the two may be different. But getting the methane from the coal first, provides the Coal Bed Methane (CBM) that has become an additional source of natural gas. There is a video on recovery that lasts 8 minutes on Youtube, showing how much of the drilling uses the long horizontal drilling that is becoming common for recovering gas and oil in more conventional deposits. It is that process that EPA has already decided does not threaten surface drinking water quality. Already it provides about 7% of natural gas production in the U.S. But it is not always possible to do this drainage from the surface, particularly in mountainous terrain, where it is difficult to get the necessary drilling rigs in place. And so the gas is often still there when the coal mine is put into production? And at this point, again, based on how much gas there is, and whether it can be economically recovered for sale an analysis will likely be made on whether it would be worthwhile putting in a methane drainage network. What is most useful is to drill long horizontal holes into the coal before the coal is mined, since in this way there are fewer problems, and the gas recovered is generally of better quality. If these weren’t drilled before mining they can be drilled from the developing tunnels of the mine, though typically these will not reach out as far as those from a dedicated surface drilling operation. Even if there is not enough gas to make it economic to sell, with higher volumes in the coal it can be cost effective to drain the gas from the seam before it is mined, or as part of the mining process, since this can increase the safety of the mining process itself. In this case drainage holes must be drilled not only into the coal. Because the advancing face causes the coal to crack about 9 to 15 ft ahead of the longwall face itself, these cracks also work their way into the roof. So that gas can be desorbed into the cracks, and is then carried in the fractures that open around the mining operation, not only into but also over the mining operation and into the collapsing rock pile behind the face. Thus to get all the methane out of the vicinity exhaust holes need to be drilled not only into the coal ahead of the face, but also into the overlying rock, to capture all this methane, before it causes a risk. These exhaust holes are increasingly fitted with monitoring instruments that feed data to a central computer and software that monitors levels of the dangerous gases within the mine so that, when dangerous levels are detected, then the operations may be closed down. Sadly, however, the instruments are not sensitive enough or in enough places that they can capture any release of gas from small pockets that can ignite, with tragic results. Our thoughts and prayers remain with those who have lost loved ones in West Virginia, and in other recent disasters of this type around the world.